Our knowledge of intellectual mechanics related to problems’ resolving allows us to build-up a unique way to model logical thinking via mind-maps. This is a new generation process of knowledge capitalization. I2Kn is a community tool to capitalize knowledge and know-how, dedicated to scientific and technical issues. i²Kn is based on an innovative methodology, modelling logical thinking and registering issues/solutions couples. 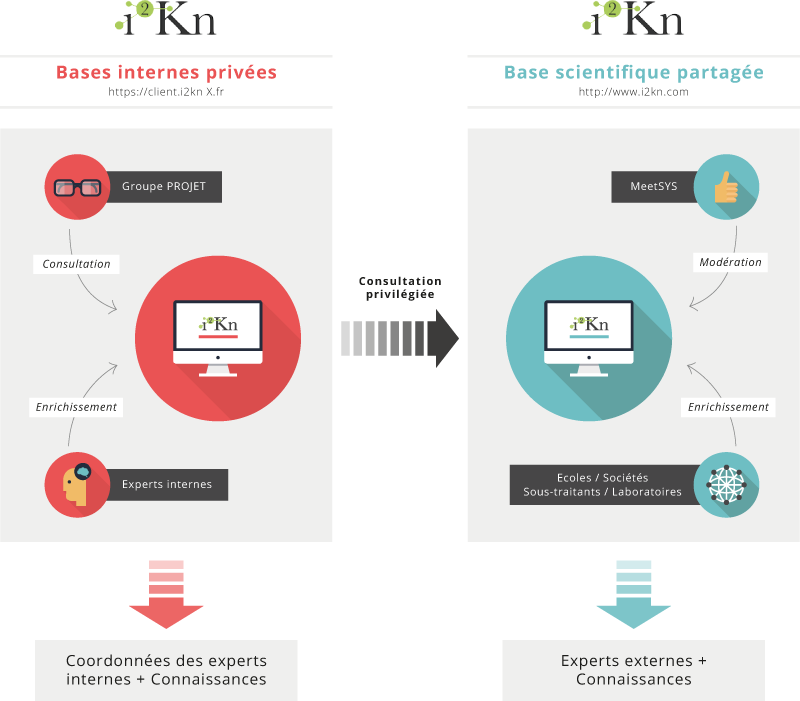 i²Kn classifies the experts by contributions and not by competencies. It establishes links between technical actors (experts and users), know-how and solutions (presented in a functional and composite way). This singular architecture satisfies industrials’ needs of innovation and capitalization of logical thinking. For each company i²Kn is composed of two scientific community databases. A scientific database shared with contractors, suppliers and research laboratories. This scientific database is filled-in with the ten-years experience of MeetSYS and is structured like a dictionary of technical elementary functions; it summarizes all the fundamental physics’ functions; it allows external specialists and technology’s suppliers to identify themselves as experts in the functions for which they have developed expertise; consequently, you access a network of specialists who handle knowledge and pieces of technology and who can bring you the innovation you are searching for. Collaborative innovation guided by a functional approach. You work in the industrial field and you want to understand how we manage know-how capitalization? Please read the page "Our approach/i2Kn". You work in a research laboratory or a school, you are a technology supplier, you want to contribute to our database enrichment, to have access to the new technologies or simply to discover science? Click on the following logo and join our community.